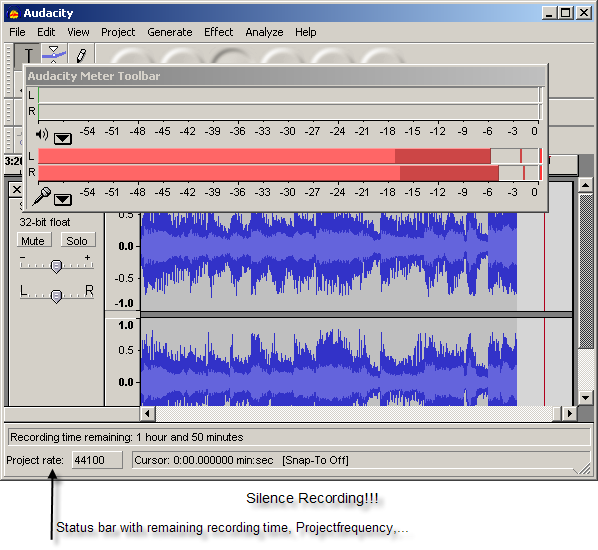 On this page you'll find information about recording audio on to the computer with Audacity. Don't forget to configure Audacity first. Before actually recording something, first a little preparation. • Start Audacity only, no other extra programs. • Float the Meter Toolbar and stretch it horizontally or vertically. To float the Meter Toolbar, go to the menu bar and select View, Float Meter Toolbar. Normally the input source is Line In. You can select microphone (if available) if you want to record sound with the attached microphone. More options are available as the case may be. 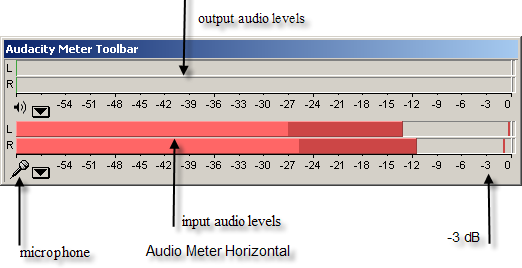 • Click on the audio input meter, the meter with the microphone in the Audacity Meter Toolbar. You can now monitor the input level. • Find the loudest passage of your vinyl record or audio cassette. The peak levels should not pass the -3 dB level. Adjust, if necessary, the volume level with the slide bar control, right side of the microphone. Put the needle just before the position of the track you want to record. Click the record button on the Control Toolbar of Audacity and slightly drop the needle. For an audio cassette it works analogously. The recording has started! During recording, stay away from the pc and/or stereo! Once the tracks have been played, you stop the recording by clicking the stop button of the Control Toolbar. The first thing you have to do is saving your recording. Save the complete recording as a WAV-file. If the recording contains the complete A side (or B side) of your vinyl record save each side as one WAV-file. Use a copy of the saved recording to edit. If something goes wrong, pc hangs, you have the original as a backup. And you don’t have to do the recording again. Saving goes as follows. Select File, Export As WAV… Give a name (like, name of record + A side or B side) and location and click on Save. Now you’re done recording, you can continue with the next step, editing (splitting) the audio file. Back to top of 'Recording'.